For those of you who regularly read and enjoy my content, you will know I have a young team, some young clients, as well as 2 teenage sons which means I’m always surrounded in popular culture. This also includes my musical tastes and while it’s mostly eclectic, I have a bit of a thing for the music of Little Mix. One of my favourites is, “This is a shout out to my Ex”, my initial thoughts on first listen was that it was empowering to people coming out of relationships. It was only on further investigation I realised the lyrics were written around the text break-up of the band member Perry Edwards to her then-fiancé Zane Malik. Fortunately for me, the heartbreak of broken personal relationships, touch wood, are a thing of the past and although no relationship is perfect, Mr Edgar and I have managed to weather the storm for over 24 years. But, it was something that happened to me from a business perspective which has led to me writing the blog and striking a chord with Perry on how it feels to be “dumped”. I was recently at a very high-profile entrepreneurial event in London when I got chatting to a friend of a friend. Let’s call him James (not his real name) for the sake of this blog. James was an ex-hedge fund manager, turned VC and is known for mentoring scale up companies all over the world. I’m a little sponge when it comes to knowledge and always find it fascinating to find out new things, new angles and new techniques. As a dyslexic, I’m more of a verbal communicator and enjoy people interaction. The event was busy, and it became difficult to chat, so James suggested a Skype to get to know each other better and continue our scaling conversation. This seemed like a no-brainer, he was keen as mustard and he set the date with the calendar invite there and then. Building a business relationship is no different from building a personal relationship, this is the equivalent of “grabbing a coffee”. You are exploring to see if you have things in common, if you like each other and if you want to see each other again. The skype went well, we found out a bit more about each other, and from my side, it appeared, I had found someone with experience in scaling a business, who believed in me and could see the potential to reach my massive goals and ambitions. Maybe I had found a knight in shining armour who didn’t want to invest or charge but instead mentor me for the satisfaction of seeing me grow. There was only one way to find out and that was to take it to the next level a face to face, 2-hour meeting in London. Again, like dating, this is the equivalent, of going for lunch, you are committing a bit more time to get to know each other better. Prior to the meeting, I was given business tasks to do, which I had not only completed but had added extension work too, if it was school, I would have received a merit for effort. So, on arrival, I felt prepared for the meeting with my new mentor and someone who could potentially improve my business. The face to face meeting again went well and we shared more information and got to know each other better. We did a gap analysis of my strengths and weaknesses and looked at the areas James could add value, structure and knowledge to scale the business. At the close of the meeting, another list of tasks was created in preparation for our next meeting the following week. From my side, things were going swimmingly. There is an urban dictionary phrase used in dating called “Punching”, people who are punching above their weight are generally going out with women/men of far superior quality in either the face/body department. I felt I was definitely “punching” in the business department and was happy to see him again the following week. It was the day before the next meeting, after I messaged to confirmed, that I received the “It’s not you, it’s me email”. James had been appointed a position as Vice Chairman of a major property company as well as advisory board positions on a number of other firms, so didn’t have time to give me the support I needed. Perry had been dating Zane for 4 years before she was dumped by text, so I am in no way comparing my 2-date mentorship meetings to what she went through. 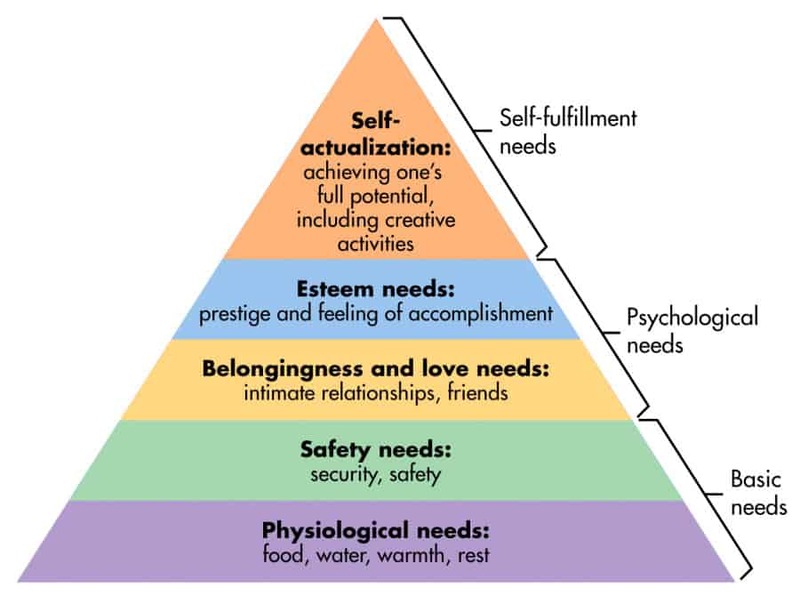 But no one likes to be rejected, Maslow’s Hierarchy of Needs shows that we need social belonging to perform at our best. Esteem is another one of the parts of Maslow’s Hierarchy, and when you are “dumped” either in a personal, business or sales relationship, it strips part of your esteem away which affects your confidence. It then starts to create a fear and you put up a barrier you protect yourself from letting it happen again. This is very prevalent in sales, and why lots of people don’t enjoy selling, they have a deep-rooted fear of rejection and don’t want to put themselves out there in case the answer they get is that very much daunting ‘no’. This is why dating apps are so popular, it doesn’t feel as personal when someone swipes left. It’s also why lots of salespeople and business owners hide behind emails, you can pretend they didn’t get the email. Maybe you went into their spam, by mistake, maybe they are not rejecting me, this means I can avoid calling so I can put off a “No” as long as possible, so I don’t feel rejected!! What are my top tips for getting over rejection and improving relationships? No’s are going to happen and not every relationship is a success. It would be easy for me to whinge that I spent both time and train fare with a mentor who ultimately didn’t want to work with me. But during our 2 sessions together, something magical happened. By doing my extended homework and writing things down in preparation, I have clarity on my business plan, without the focus of the meetings I would not have had much direction around my long-term plan. There is a positive in EVERYTHING you just have to dig deep, find it and focus on it. Look at Perry, Little Mix are flying, and she doesn’t have to worry about who or what Zane is up to when he’s on tour. A “No” is a positive, in the words of my buddy Will King, King of Shaves, “A no is not forever it’s just for now”. If you keep a relationship open it’s not rejection, so mentally it helps you to stay positive and focused. In a previous blog, I talk about Glasgow’s loss and Cape Town’s gain. There will be another mentor for me who benefit my skills and I from theirs and we will start a new relationship to help me to scale. GROW UP. Lots of our unhappiness is of our own making. You cannot make someone love you or want to be with you if they don’t. It’s the same with sales, you cannot sell to everyone and timing is everything. You can spend your time moaning about the one that got away, or you can take the learning and move on. Work on developing yourself, growing your knowledge and skills which will ultimately grow your confidence and reduce your fear of rejection. If you don’t have confidence in yourself, how do you expect other people to have confidence in you? Watch this space over the next few months, lots of changes are happening to Sales Coaching Solutions, The Entrepreneur’s Godmother, and I am launching Alison Edgar my new personal brand as a speaker and author. Sign up below to be among the first to check out my new website. I so enjoy following your journey.